"There is no one left for Mila to trust. Except for a boy she barely knows. In this latest installment of the Mila 2.0 series, we find Mila trying to hunt down a link to her past, but as she runs away from Holland is she running towards more trouble? Renegade will bring a thrill as you travel with Mila and Hunter to find the truth of her origins, Vita Obscura, and what may be Mila’s future. Although Renegade began a bit slow for me (I’m not a mushy gushy romantic genre type,) I was excited when the pace was picked up around the fifth chapter, and suspense stepped in. I love how I kept wanting to read more and more as Mila traveled to find and retrieve files to her past. With a nation suspecting her of murdering her mother, Mila must keep on her toes and her tactics and skills as an android become quite handy. The only problem she has is getting control of her emotions, and with her constant paranoia, and trust issues, her problems bleed onto those who she wants to trust the most. Hunter plays an interesting role in this book, and I’m very pleased that he isn’t just a romantic interest, but has an actual purpose in the plot. So many emotions are played throughout Renegade, and it had me guessing and suspecting until the end! Is Mila’s paranoia justified? Is Holland really the enemy!? I was just feeling all kinds of way for Mila, and I truly just wanted people to treat her like a normal person with normal feelings! I hated seeing Mila’s feeling get hurt over and over and I felt horrible to see that she hated her feelings as well. Maybe Holland was right all along to want to remove her emotions? You better read and find out! In all, I found that this book answered a lot of unanswered questions from the first book, yet presented quite a bit more. I love how the action played out and how upbeat it was! Was it worth her time looking for her past? 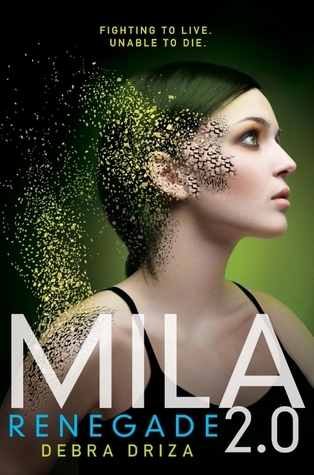 With her mix of android parts and human cells, is she becoming more human... or the opposite? What’s in Mila’s future? There’s so much to devour in Renegade, and you better hand on because Hoooooly Cliiiiiifhanger!! I need the next book pronto! !